Description: After his departure from New York two years ago to meet up with his almost-fiancee, Zayne Beckett is the last person Agatha Watson wanted to stumble upon in her travels as a reporter with the New York Tribune. Quite pathetically bedraggled, he clearly needs to be taken in hand and sent back East to his family. Although she no longer has feelings for him, Agatha realizes--by hook or by crook--she'll have to be the one to get the obstinate man home. Zayne has no desire to be taken anywhere and is prepared to drag his heels all the way home . . . until he finds himself slipping back into the familiar banter of his former friendship with Agatha. Once they arrive in New York, Zayne realizes Agatha's determined nose for news has earned her a few enemies, and he hopes to repay her help with some help of his own. When she rebuffs all his attempts to prove himself a knight in shining armor, the lengths to which they'll go to win this battle of wills lead to some memorable antics. 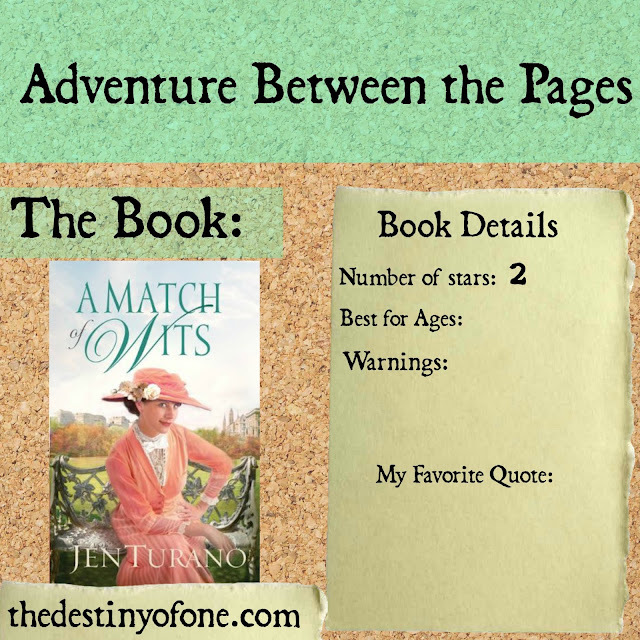 Everyone else may think them a match, but nothing could be further from the truth--until Agatha finds herself in real trouble. Have these two stubborn, too-smart-for-their-own-good people been meant for each other all along? This is one of the hardest reviews I have had to write since I started writing reviews. I normally finish a book before passing judgment, but I just couldn’t with this book. This will be my first book from Bethany House that I have written a negative review on in a long time (they are one of my favorite publishers) as well as the first review I have ever written on a book I didn’t finish. The first chapter of the book had me laughing. I mean, who wouldn’t laugh at chasing a pig through a hotel? Agatha also seemed like a funny character whom I would love. After all, she was spirited and was always causing trouble. How much better could it get? Sadly for me, this book quickly went from funny to ridiculous. Agatha went from being sprinted to being over the top. I might have been able to accept this book as a comedy (as I like over the top shows like Gilligan’s Island), but then they introduced a serious character, and that ruined it. I would be willing to try this author again, as I can tell she has some talent, and I have heard some of her other books are better.